How to add password to PDF files? 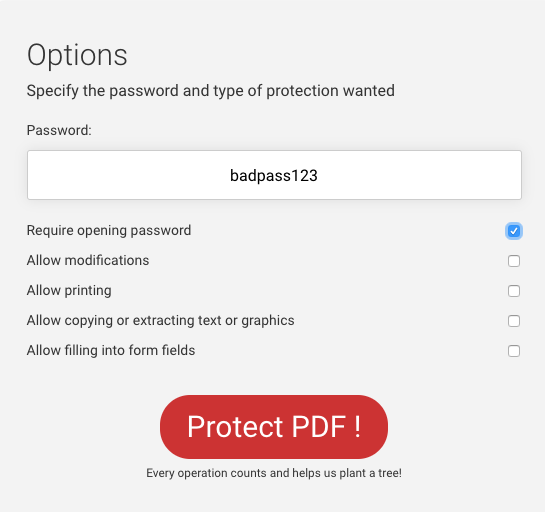 The Protect PDF tool enables you to restrict access to your PDF files, set permissions and add password protection. Specify the password and access permissions. Requiring an opening password will encrypt the entire file content and require entering the password when opening in a PDF viewer. The other permissions allow restricting modifications, printing etc. If an opening password is required, these settings are overridden. Click "Protect PDF" to go ahead and apply the restrictions. You will then be redirected to the download page where you can download the protected PDF files once it has been processed. The file names refer to the original file name (origfile_protected.PDF). Simply click on Download to download each file. Note that you need to be logged in with an account to be able to download files. If you do not have an account, you can sign up for one and download your file right away. 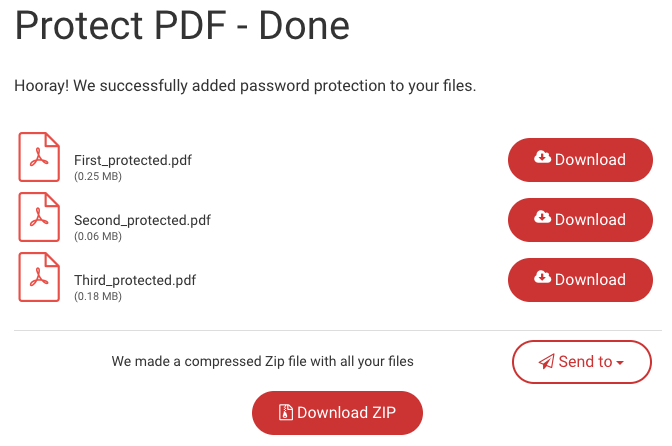 Once you are done, you can click "PDF Tools" to navigate to other PDF tools, or to go back to protect another file, simply click the Protect PDF link. If there was something wrong and you want to change the access permissions or level, you can use the "Do over" button. It brings you back to Protect PDF but keeps all the uploaded files in tact, so you can change the restrictions without starting from scratch.